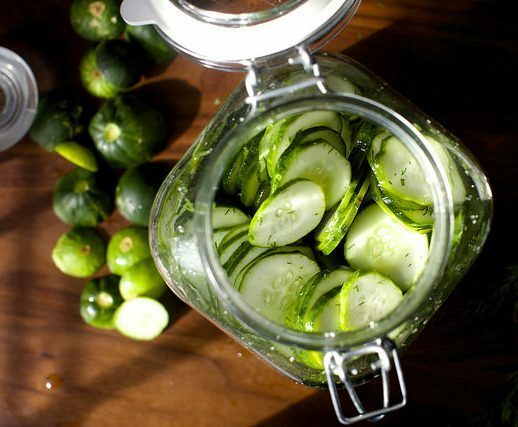 What to do with all those cucumbers, quick and easy dill pickles! Slice your cucumbers very thin — 1/8-inch slices here but usually go even thinner on a mandoline. Place them in a 1-liter or equivalent lidded jar. Add 3 teaspoons salt and dill, then pour in white vinegar. Close the jar and give it a few shakes to begin distributing the ingredients. 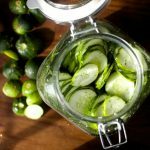 Within an hour or two, the salt will draw the moisture from the cucumbers and wilt them, while the liquid becomes a perfectly balanced pickle brine. Place jar in the refrigerator near the front, which should remind you to shake it once or twice more over the new few hours.